Welcome to the JVNP 2.0 Update featuring a JV request courtesy of fellow JVNP 2.0 Partner David Perdew (I’m Turning 65 NAMS affiliate contest JV invite), Buzz Builders (Glen + Natalie Ledwell – Mind Movies – Chakra Awakening, Anthony Rousek – Commission Breakthrough, Jamie Lewis – Domainer Elite Pro, Aaron Sustar – Spin Rewriter 8.0 launches), and More … in Today’s earn commission & prizes celebrating David’s special senior moment edition. Hey there, Fellow JVNP 2.0 Partner. 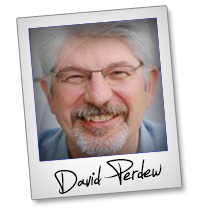 This is the David Perdew I’m-Turning-65 Contest. It will run for 15 days. My birthday is Oct. 20th, so we decided to give you the gifts. We have two contests running. This is a traditional overall sales contest that will be based on the most sales of any NAMS products during the 15-day period. There’s big prize money at stake. This is the daily NEW referrals contest . This levels the playing for all, even newbies, to drive as many people in each day. And we’ll pay $50 per day to the person who brought in the most NEW referrals during the previous day. Essentially, we want to pay you for a long, long time. Date: 12:01 A.M. ET Monday, Oct. 16th to Midnight PT, Monday, Oct. 30th. 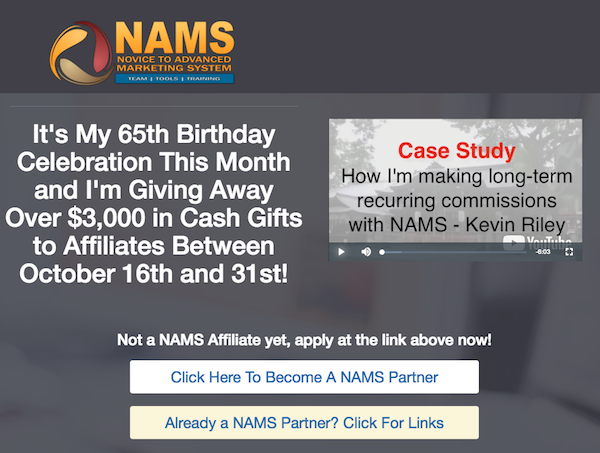 >>> NAMS Affiliate Registration & Login. I’ll send you updates as the launch progresses. $2 Per Lead, $750 Per Sale … & 75K in Prizes! Last year on average our affiliates earned $25 EPC and this year it’s going to be BETTER! Over $75,000 in prizes plus a “Control Your Destiny” prize pool that GUARANTEES $2.00 per email! No matter what you’re list size is, our proven sales funnel will help you earn HUGE commissions! Zero Up™ is a never-seen-before software suite built for beginners and advanced marketers! Fred Lam – Zero Up 2.0 JV page. High Converting Webinar + Proven Big Ticket Product = Mucho Affiliate Commissions! Social Agency Pro: GoMobile Solution’s New, Results in Advance Strategy and System where ALL the work is Done For Your Audience AND their In-House Sales Staff Even Lands The Clients FOR THEM! Why This? Why Now? Because business owners Now realize Social Media is no longer a ‘Nice To Have’, but an Absolute ‘Must Have’ for their business! Damien Zamora – GoMobile Solutions – Social Agency Pro JV page. JVZoo #1 Best Seller … Earn up to $535 Per Lead! 25 Best Sellers Launch. Automated, 100% Unique Content Creator & Messenger! Earn Up To $535 Per Lead. $9.81 EPC. 23% F/E Conversions. 87.1% OTO Conversions. 50% commissions 4 funnel deep. $12,500 JV Contest & Cash Prizes, 25+ swipes & more details here => Brett Ingram + Mo Latif – Quotamator JV page. Help your audience Balance, Heal and Energize each of their 7 Chakras! Chakra Awakening is a program designed to help balance, heal and energize each of your 7 Chakras. Earn 50% on each $47 sale. JV Prizes and more. Glen + Natalie Ledwell – Mind Movies – Chakra Awakening JV page. Anthony Shares Super Affiliate Ben Martin’s $719.45+ Per Day Affiliate Commission Secrets … You Earn 100% Commission! Get ready for 100% commissions because on the 17th of October 2017 Commission Breakthrough goes live! Anthony Rousek – Commission Breakthrough JV page. Grab Your Share of Jamie’s $1700 Sales Funnel + $5K JV Cash Contest! $100,000+ in domain marketplace sales, $700,000+ in revenue, $250,000+ in commissions paid out to affiliates? Yes, DomainerElitePro is back with all new lists, new marketplace features and tons of new case studies documented by our users. Over $5000 in CASH prizes await and top affiliates will receive reciprocal promotions. Jamie Lewis – Domainer Elite Pro JV page. It’s Spin Rewriter’s 6th Birthday Bash … and You’re Invited! You can never have too much quality content when it comes to marketing, right? Well, Spin Rewriter is the best article spinner out there. And because it’s the best, it sells like crazy… – $6.4 Million+ in sales – $2.7 Million+ paid to our affiliates – Hard-coded 50% recurring lifetime commissions – $10K+ JV contest. Aaron Sustar – Spin Rewriter 8.0 JV page. $7.03 Average EPC on RAW Clicks and a 57% Opt In Rate! Over $20,000 in CASH Prizes, £1000 commissions per sale, PLUS yearly up-sell comms! $7.03 Average EPC on RAW Clicks and a 57% Opt In Rate – Proven In 3 Niches: Personal Development, Biz Op & Financial/Investing. Earn Commission helping Your Audience become Happier & More Successful! Fruitphul – The First Major Productivity Software & Success Suite Close the Gap Between Where Your Subscribers Are and Where They Want to be in Both Business and Personal Life with a New Cutting-Edge Productivity App and High-Quality Training Integrated on Teachable.com! Ben Murray – Fruitphul JV page. Popular, Recently Released, Evergreen, High Ticket, Webinar Based Promotions. Simon Hodgkinson + Jeremy Gislason, MindValley, Anik Singal and other fellow JVNotifyPro 2.0 partners are waiting in the wings … keep your eyes on your Inbox, and follow the action in the JVNP 2.0 Premium VIP JV Announcement archives.